Designers Diogo Aguiar and Teresa Otto of Portugal have designed and built a temporary bar made of 420 IKEA storage boxes for a competition organised by the architecture faculty at the Universidade do Porto in Portugal. The modular white cube was built by the students in Parque da Cidade, Porto, and could be transformed into a bar by partly folding open one of its walls. The semi-translucent storage boxes varied in size and were fixed onto a metal structure. At night they were lit using LED lights that responded to the music being played, each box giving a different brightness according to its depth. See also: The Bucky Bar (February 2010), a temporary bar made of umbrellas. Photographs are by Sandra Neto and Diogo Aguiar. Year after year, the students of Porto School of Architecture are invited to think on a temporary bar to represent their institution with the expected dignity, as an outstanding architectural object. The given implantation, the fast construction and the low budget are some of the premises which must be considered. The proposed bar stands as an iconic cube of light, composed of modular parts. Taking advantage of the IKEA build-by-your-own world, the project is a parallelepiped made out of different depth storage boxes which give it the modular diversity on its textured skin. After winning the competition, some adjustments were done and the bar grew to 4,7 metre high, standing as a visual reference. Built in one week with the help of students, it was completed one month after the jury announcement. A total of 420 boxes were first fixed on a wooden structure and then attached to the main metal structure, on site. 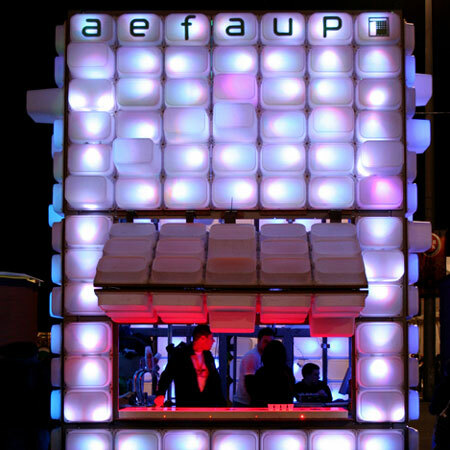 A huge LED net was fixed behind the boxes, allowing the bar to dramatically change its appearance: by day a white abstract and closed volume; and by night a box of changing light following the DJ set. Structure and other Specialties: Acústica F.E.S., Lda – Estruturas, Iluminação e Som, with the colaboration of students of AEFAUP.